An early morning fire on Sunday caused substantial damage to a house on Third Street in Mason, which was occupied by Ashley M. Smith. Smith and several pets were able to escape the four-alarm blaze unharmed. Pictured is a scene from the fire. 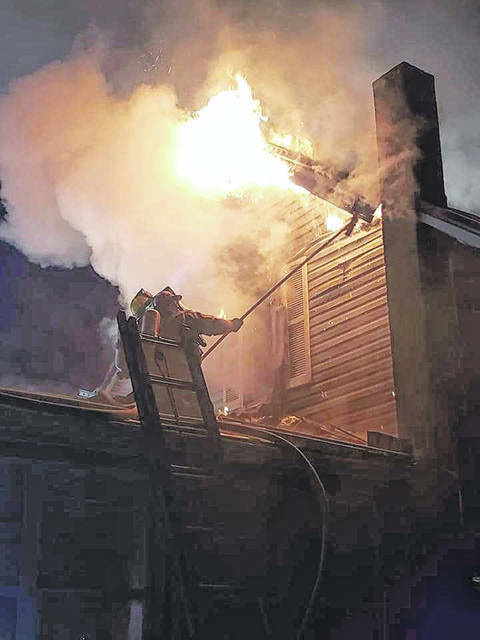 MASON — For the second time in three days, the Mason Volunteer Fire Department was called out in the early morning hours for a major structure fire. The most recent occurred Sunday around 6 a.m., at a two-story home on Third Street. Firemen arrived at the house, which is occupied by Ashley M. Smith, to find heavy smoke conditions, according to R.C. Faulk, fire department information officer. New Haven Fire Department was on the scene as well, and due to the size of the house, the Middleport and Pomeroy departments were also called in. With most of the blaze on the second floor, firemen were hindered by a narrow stairway. The Pomeroy ladder truck was used to enable firefighters to cut through the metal roof. At least four roofs were on top of each other, with the fire traveling between the layers, Faulk said. Following the establishment of vertical ventilation, crews were able to gain access to the second floor and extinguish the blaze. Smith and several pets were home when the fire began, but were able to escape without injury. Faulk said the resident had working smoke alarms that the Mason department had provided her through the 2018 campaign of the Red Cross Smoke Alarm Program. There were 21 firefighters on the scene, where they remained for approximately three hours. Faulk said the cause of the blaze is believed to have been an electrical issue. The Sunday fire followed one earlier on Thursday, when a blaze destroyed a mobile home on William Lane. The trailer was owned by Brenda L. McCarty, and the fire is being investigated as arson.